Having placed more than 2000 volunteers who have shared their lives and skills with the poor and marginalised throughout the world since its establishment in Dublin in 1960, Viatores Christi has a long and proud tradition of reaching out to those most in need. In 2016 the lay missionary organisation supports the work of 38 overseas Mission partners and currently has 27 volunteers serving in Africa, SE Asia, Latin America and the Caribbean. This week Viatores Christi is particularly proud that one of those volunteers, also one its longest serving – Westport native, volunteer Gena Heraty is to receive the Oireachtas Human Dignity Award from Ceann Comhairle, Seán Ó Fearghail TD, at a ceremony in Leinster House on 8th December. Each year the Oireachtas Human Dignity Group presents the award to a person who has shown huge commitment to the promotion of human dignity. After joining Viatores Christi in the early 1990s and completing its overseas development training programme, Gena went then went on assignment to Haiti in 1993 to volunteer with NPH (Our Little Brothers and Sisters) – an orphanage in the hillside village of Kenscoff, 10 km from Port-au-Prince. Gena began working in the Special Needs Unit of its children’s orphanage and has since gone on to become director of the Special Needs Program. Throughout her time in Haiti, Gena has grown the Special Needs Program – developing new interventions for over 30 children and young people. Part of the Program also offers much needed outreach which provides life-changing medical, rehabilitation and educational support for around 100 families in the outlying community where children have severe physical or intellectual disabilities. The project is supported by Irish Aid funding from Misean Cara. 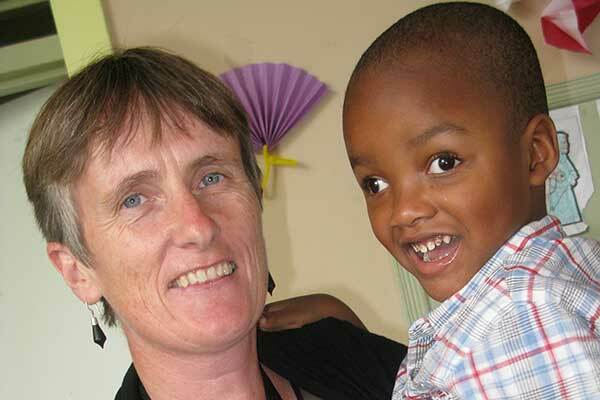 “Generally in Haiti, if you’re a child with special needs you’re abandoned at hospitals. You’re not abandoned because your mother doesn’t love you. You’re abandoned because your mother doesn’t have the means to take care of you,” said Gena in an interview last year, which outlines the harsh reality of life in Haiti – the poorest country in the Americas and one of the poorest in the world (with a GDP per capita of US$ 846 in 2014) and as a result with little or no basic services in areas such as health or disablity. Over the last 20 years Viatores Christi has placed many volunteers with specialist skills to work alongside Gena. It currently has a specialist physiotherapist and programme co-ordinator in Haiti with another physiotherapist working at a different NPH site. It is life changing but challenging work in an environment beset with ongoing security issues and of course other challenges such as severe hurricanes and earthquakes. Viatores Christi will also continue to support Gena and the people of Haiti – as thankfully many of its volunteers are willing to share their lives and skills and walk in solidarity with the Haitian people. Give a loved one something different this Christmas!